LAKE MILLS, Wis. – December 2017 – Kapro Tools’ line of OPTIVISION™ Red leveling products provide unmatched clarity. 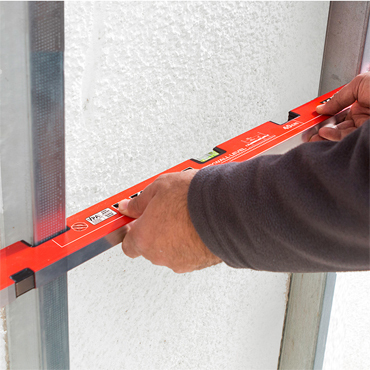 The OPTIVISION line includes the 905 Condor Box Level, 935 OPTIVISION Red 10-inch Toolbox Level, 946 Smarty 4-inch Magnetic Pocket Level and 930 SmartCast Heavy-Duty Mason’s Level. 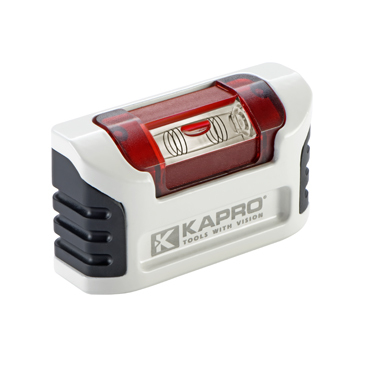 Kapro’s patented OPTIVISION vial features an easy-to-read vial bubble with super defined edges and strong surrounding color definition, as well as an extra set of reading lines for setting gradients at 1 and 2 percent. 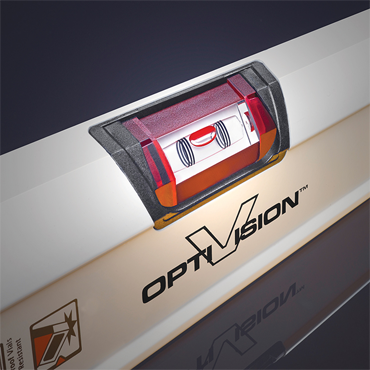 The OPTIVISION Red’s unique epoxy-locked tilted setting offers a direct line of sight to the bubble, which makes reading the vial easy and provides more precise results. The high contrast ratio between the red bubble and vial liquid in Kapro’s solid acrylic vials makes visibility up to eight times easier than clear liquid vials with white backgrounds. OPTIVISION provides superior visibility in low light and bright light and is UV-resistant, meaning the vial always maintains its original color contrast and visibility. • Patented Plumb Site® Dual-View™ vial with RedEffect™ to provide the only true plumb view. • Reinforced aluminum profile with a finely milled surface and Ergo Grip™ rubber handle. • Oversized shock-absorbing rubber end caps to protect the level’s integrity through knocks and falls. • OPTIVISION Red horizontal gradient vial, bridge at horizontal vial and tilted vial. • Three solid acrylic shockproof vials. 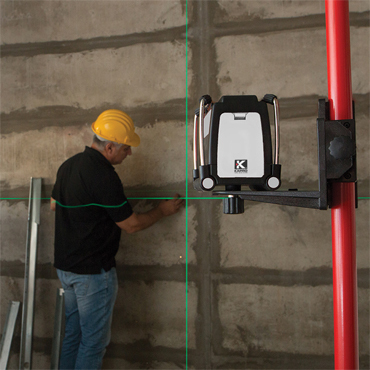 • Angle finder with gradient markings every five degrees. • Rare-earth magnets for a strong grip to any metal surface. • Finely milled surface with V-groove. • Advanced impact resistance end caps to protect the level’s integrity. • OPTIVISION Red horizontal vial. • Gradient lines for measurements up to 2 percent. • Durable cast aluminum body with shockproof rubber end caps. • Large base with rare-earth magnets. • Tilted, tri-surface horizontal vial. • Bridge at horizontal vial. • Heavy-duty cast aluminum tapered body. • Shock-absorbing rubber strike pads and end caps. Kapro’s OPTIVION series levels are certified as conforming with their stated accuracies of <0.0005 in/in, the highest in the industry, by the German VPA Laboratory which provides official international verification of their high accuracy and quality. Kapro’s solid acrylic vials carry a lifetime warranty, guaranteeing them for the highest level of accuracy as well as against leakage or breakage. Kapro Tools Inc. is a leading manufacturer and developer of innovative hand tools for the professional market. 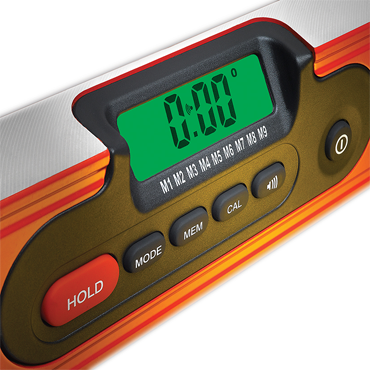 Leading the European market for more than 30 years, Kapro has made the finest quality spirit levels, laser levels, layout tools, marking and measuring tools. Kapro Industries is headquartered in Kadarim, Israel. The company’s U.S. subsidiary, Kapro Tools Inc., is located in Lake Mills, Wisconsin. Kapro owns and operates its state of the art manufacturing facilities in Israel and China which are certified compliant with ISO standards 9001, 14001 and SA8000. To learn more, visit kapro.com.